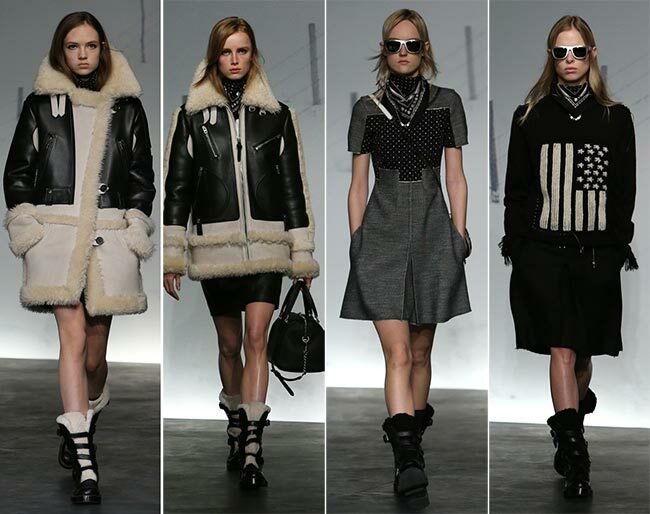 Stuart Vevers sent an array of super-wearable and functional clothes down the catwalk at the presentation of his Coach fall/winter 2015-2016 collection today at New York Fashion Week fall 2015. It was a line to instantly fall in love with from the cool clothing pieces showcased to the chic accessories and the amazing way of combining them all into outstanding day-to-day looks. It’s a daywear collection, filled with warm outerwear options for fall and winter, stylish pants, skirts and tops, as well as covetable shoes and handbags. From the color palette used to the great attention to details, every aspect of the new Coach line has been well though over to turn it into one of the most successful fall collections one can look to for everyday outfit ideas. 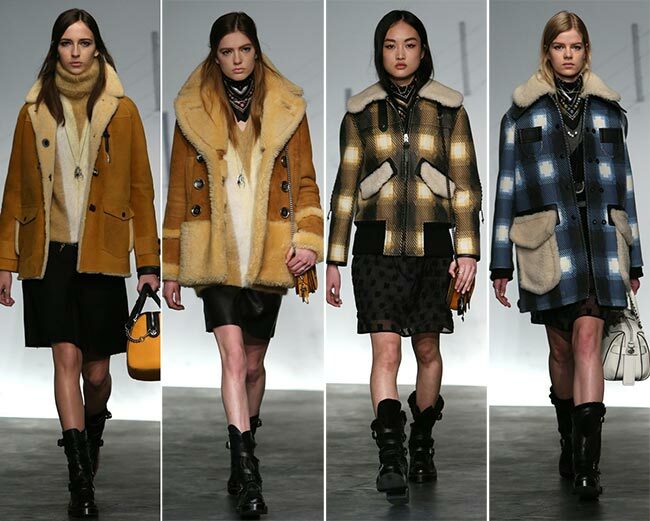 Apparently, shearling coats are making a huge comeback thanks to the Coach fall/winter 2015-2016 collection, coming in different shapes and shades to cater to everyone’s styles and needs. Exactly this way is the show opened, bringing a luxurious shearling coat in soft cream hues with black leather inserts for a higher impact. The same materials, style and colors have been applied to create those foot-friendly and warm boots that finish off the simplistic, yet totally bewitching look just ideally. These wanna-have boots complete many more looks showcased throughout the show, like the following outfit composed of the same style of the coat cut at a shorter length and matched with a simple black mini skirt. 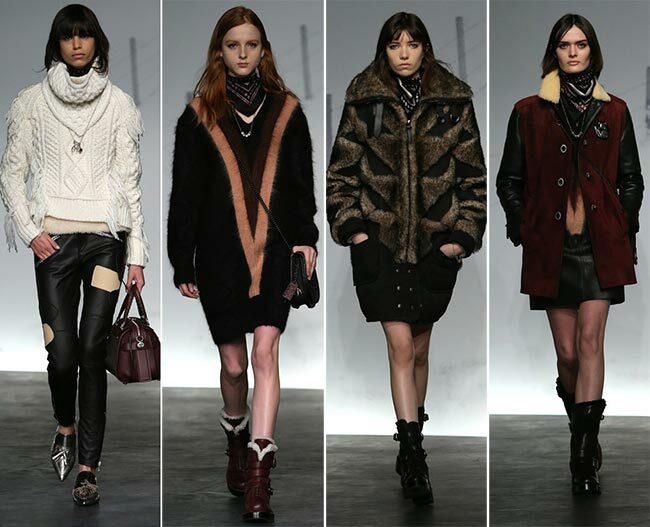 Then we also see a vest alternative of the shearling coat, which looks way too cool to be missed. The overall color palette of the Coach fall/winter 2015-2016 collection centers around black, cream and gray tones, at times spiced up with touches of camel, brown and bordeaux. The looks are mainly kept monochrome and it’s the use of patchwork, appliqués and interesting textures that makes a strong sartorial statement throughout the collection. One interesting pattern used is the American flag print used for a black knit sweater that comes teamed with a knee-length black skit. It’s not just the chic and cozy outerwear that gets us enchanted in the Coach fall 2015 RTW collection, as we also discover lovely mini dresses with side pockets, knee-length and mini skirts, warm knitted sweaters and leather jackets. 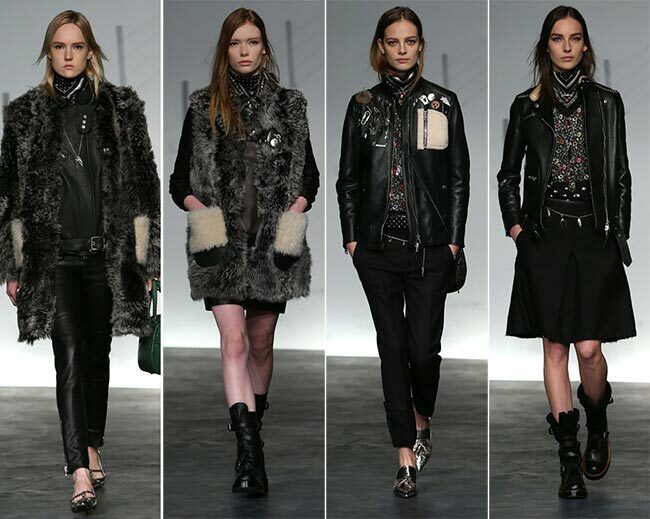 Generally, leather plays an important role in the entire line, coming in the black color for the rock-chic attitude and being used for a number of mini skirts, biker jackets and leather pants with zips. The closing look of the show is a head-to-toe leather look with the black jacket with emblems being the coolest piece we all want to own right away! Besides this, we are also treated to some luxe fur pieces and see-through materials used for the below-the-knee dresses with dots that feature a contrasting material for the top part. While the clothing pieces and the outerwear designs are already chic enough for building up show-stopping fall looks, no less important are the accessories in the collection. 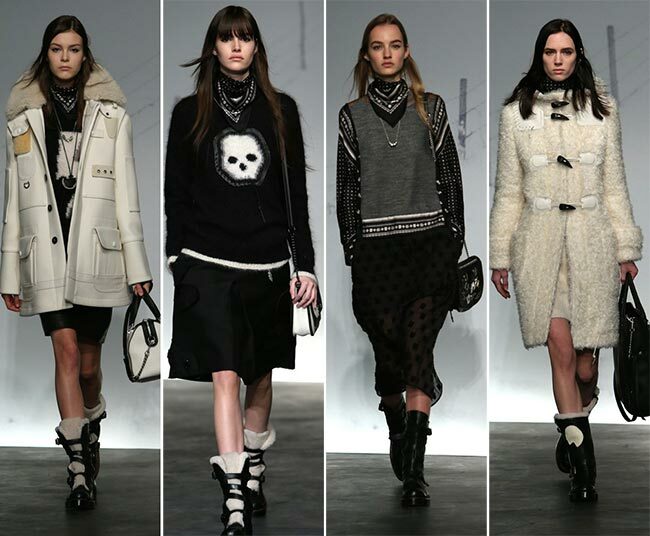 Think cozy boots and point-toe flat shoes, roomy bags, kerchiefs tied around the necks and stylish necklaces! The models’ hair is left loose and natural, while the makeup places the focus on the eyes. 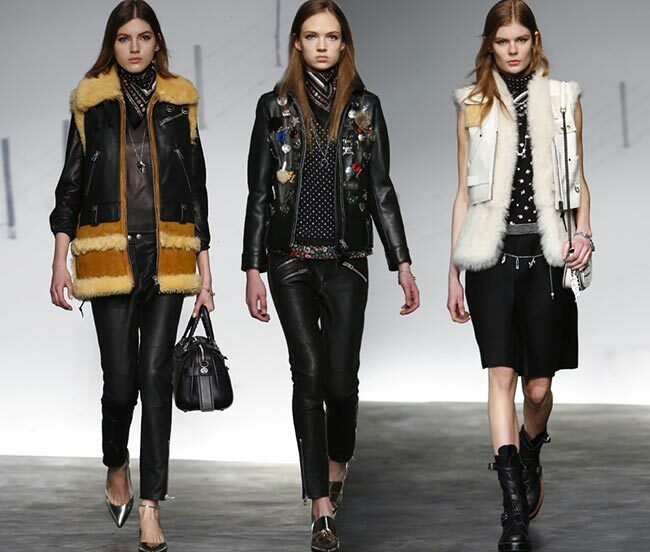 It’s a rock-chic collection full of easy-to-wear daytime looks!